Ruth is enjoying having her walker when we go places. She hates to be held, she wants down (normal for a 1 year old!). 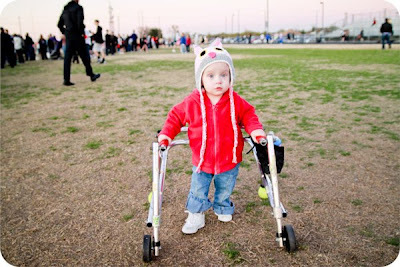 The walker lets her have her independence, without crawling around on dirty grounds! She hasn't mastered steering the walker just yet, but she is getting there! Oh my gosh, look at that hat! She's a doll!